Abingdon-on-Thames /ˈæbɪŋdən/ AB-ing-dən, known just as Abingdon between 1974 and 2012, is an historic market town and civil parish in the ceremonial county of Oxfordshire, England. Historically the county town of Berkshire, since 1974 Abingdon has been administered by the Vale of White Horse district within Oxfordshire. The area was occupied from the early to middle Iron Age and the remains of a late Iron Age and Roman defensive enclosure lies below the town centre. Abingdon Abbey was founded around 676, giving its name to the emerging town. In the 13th and 14th centuries, Abingdon was an agricultural centre with an extensive trade in wool, alongside weaving and the manufacture of clothing. Charters for the holding of markets and fairs were granted by various monarchs, from Edward I to George II. The town survived the dissolution of the abbey in 1538, and by the 18th and 19th centuries, with the building of Abingdon Lock in 1790, and Wilts & Berks Canal in 1810, was a key link between major industrial centres such as Bristol, London, Birmingham and the Black Country. In 1856 the Abingdon Railway opened, linking the town with the Great Western Railway at Radley. The Wilts & Berks Canal was abandoned in 1906 but a voluntary trust is now working to restore and re-open it. Abingdon railway station was closed to passengers in September 1963. The line remained open for goods until 1984, including serving the MG car factory, which operated from 1929 to October 1980. Abingdon's brewery, Morland, whose most famous ale, Old Speckled Hen, was named after an early MG car, was taken over and closed down by Greene King Brewery in 1999, with production moving to Bury St Edmunds in Suffolk. The site of the brewery has been redeveloped into housing. The rock band Radiohead formed in 1985 when studying at Abingdon School. The 2011 Census recorded the parish's population as 33,130. This is 2,504 more than in the 2001 Census total of 30,626, and represents just over 8% growth in the population. 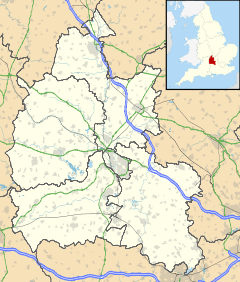 Abingdon is 6 miles (10 km) south of Oxford, 15 miles (24 km) south-east of Witney and 19 miles (31 km) north of Newbury in the flat valley of the Thames on its west (right) bank, where the small river Ock flows in from the Vale of White Horse. It is on the A415 between Witney and Dorchester, adjacent to the A34 trunk road, linking it with the M4 and M40 motorways. The B4017 and A4183 also link the town, both being part of the old A34 and often heavily congested. Local bus services to Oxford and the surrounding areas are run by Stagecoach Oxfordshire, Thames Travel, the Oxford Bus Company and smaller independent companies. Abingdon has no rail service. However, in recent years, urban expansion has brought Radley railway station close to town's northeastern limits. The small, primarily stopping-service, railway stations at Culham and Radley are both just over two miles (3.2 km) from the town centre. Abingdon's eastern ring-road and newest suburbs are connected by footpath and cycleway from Radley railway station. The Radley to Abingdon railway station branch line closed to passengers in 1963. The nearest major stations with taxi ranks are Oxford (6 miles/9.7 km) and Didcot Parkway (8 miles/13 km). All are managed by Great Western Railway. Frequent express buses operate between the local railway stations and Abingdon, run by Oxford Bus Company and its sister company Thames Travel. A Neolithic stone hand axe was found at Abingdon. Petrological analysis in 1940 identified the stone as epidotised tuff from Stake Pass in the Lake District, 250 miles (400 km) to the north. Stone axes from the same source have been found at Sutton Courtenay, Alvescot, Kencot and Minster Lovell. Abingdon has been occupied from the early to middle Iron Age and the remains of a late Iron Age defensive enclosure (or oppidum) lies below the town centre. The oppidum was in use throughout the Roman occupation. Abingdon Abbey was founded in Saxon times, possibly around AD 676, but its early history is confused by numerous legends, invented to raise its status and explain the place name. The name seems to mean 'Hill of a man named Æbba, or a woman named Æbbe', possibly the saint to whom St Ebbe's Church in Oxford was dedicated (Æbbe of Coldingham or a different Æbbe of Oxford). However, Abingdon stands in a valley and not on a hill. It is thought that the name was first given to a place on Boars Hill above Chilswell, and the name was transferred to its present site when the Abbey was moved. In 1084, William the Conqueror celebrated Easter at the Abbey and then left his son, the future Henry I, to be educated there. In the 13th and 14th centuries, Abingdon was a flourishing agricultural centre with an extensive trade in wool and a famous weaving and clothing manufacturing industry. The abbot seems to have held a market from very early times and charters for the holding of markets and fairs were granted by various sovereigns, from Edward I to George II. In 1337 there was a famous riot in protest at the Abbot's control of this market in which several of the monks were killed. After the abbey's dissolution in 1538, the town sank into decay and, in 1556, upon receiving a representation of its pitiable condition, Mary I granted a charter establishing a mayor, two bailiffs, twelve chief burgesses and sixteen secondary burgesses, the mayor to be clerk of the market, coroner and a JP. The present Christ's Hospital originally belonged to the Guild of the Holy Cross, on the dissolution of which Edward VI founded the almshouses instead, under its present name. The council was empowered to elect one burgess to parliament and this right continued until the Redistribution of Seats Act of 1885. A town clerk and other officers were appointed and the town boundaries described in great detail. Later charters, from Elizabeth I, James I, James II, George II and George III, made no considerable change. James II changed the style of the corporation to that of a mayor, twelve aldermen and twelve burgesses. In 1790 Abingdon Lock was built, replacing navigation to the town via the Swift Ditch. In 1810, the Wilts & Berks Canal opened, linking Abingdon with Semington on the Kennet and Avon Canal. Abingdon became a key link between major industrial centres such as Bristol, London, Birmingham and the Black Country. In 1856 the Abingdon Railway opened, linking the town with the Great Western Railway at Radley. The Wilts & Berks Canal was abandoned in 1906 but a voluntary trust is now working to restore and re-open it. Abingdon railway station was closed to passengers in September 1963. The line remained open for goods until 1984, including serving the MG car factory, which opened in 1929 and closed in October 1980 as part of a British Leyland rationalisation plan. The nearest railway station is Radley, two miles (3.2 km) away. Abingdon was served by a branch line but the line and Abingdon railway station were closed in 1963. Much of the original Abingdon branch line is now a cyclepath, whilst the land on which the station stood has been extensively redeveloped, and is now the site of a large Waitrose store and surrounded by a large number of new flats and houses. Abingdon became the county town of Berkshire sometime after receiving its Royal Charter in 1556. Assize courts were held in Abingdon from 1570, but in the 17th century it was vying with Reading for county town status. The county hall and court house were built between 1678 and 1682, to assert this status. The building, now the Abingdon County Hall Museum, was reputedly designed by Christopher Kempster, who worked with Sir Christopher Wren. However, Abingdon's failure to engage fully with the railway revolution, accepting only a branch line, sidelined the town in favour of Reading which became the County Town in 1869. The corporation was reformed, under the Municipal Reform Act 1835 and was abolished under the Local Government Act 1972. In 1974, under local government reorganisation, Abingdon became part of the non-metropolitan shire county of Oxfordshire and the seat of the new Vale of White Horse District Council, with Abingdon becoming a civil parish with a town council. Since the 1980s, Abingdon has played host to a number of information communication companies, with many based in the town's respective business and science parks. With this, and the result of Abingdon's proximity to academic and scientific institutions in Oxford, the town has seen an influx of young professionals taking residence in the town's many residential areas such as Peachcroft. Local councillors voted in November 2011 to rename the town back to its former name of "Abingdon-on-Thames", though this would need approval from the Vale of White Horse council. This approval was granted on 23 February 2012. Sport and recreation facilities include the White Horse Leisure and Tennis Centre, Tilsley Park and the Southern Town Park. Abingdon had four cinemas but all have closed. The last was the Regal, which closed in 1989. It stood derelict for 24 years until it was demolished in 2003 and replaced by housing development, Regal Close. The Unicorn theatre was built in an area called The Checkers Hall in the ruins of the Abbey buildings and shows plays and films on an irregular basis. In addition, a new cinema, called the Abbey Cinema has been built in one of the Town Council buildings and operates in conjunction with the Regal in Evesham. The local newspapers are The Oxford Times, Oxford Mail and Abingdon Herald. The Oxfordshire Guardian, a free newspaper, has been based in Abingdon for many years and was founded as the South Oxfordshire Courier. Local radio and television stations are shared with Oxford, although ITV retains a news gathering centre in the town, formerly a broadcasting studio, for ITV Meridian. Formerly the ITV franchise was ITV Central. Local radio is provided by BBC Radio Oxford, Jack FM, Jack FM 2 and Heart Thames Valley (originally 'Fox FM'). There was a Six TV local TV channel until 2009 and the town is now the home to the That's TV studios for Oxfordshire. The Tesco Extra store west of the town is the largest supermarket in Abingdon and has historically been one of the most profitable Tesco stores in the country. Nearby is the Fairacres Retail Park, recently redeveloped, which includes Homebase, Argos, Subway, B & M, Dreams and Pets at Home stores as well as an AHF furniture store (an independent co-operative). It originally had two long established Abingdon retailers—Vineys Home Furnishings (now part of the Lee Longlands chain but retains its name) and Mays Carpets (now part of the Carpetright chain and has re-branded accordingly). In the town centre, many independent stores, estate agents and charity shops make up the Bury Street shopping centre as major high street names have chosen to go to other towns. However, a recent renovation has attracted stores such as New Look, Peacocks and WHSmith to open branches. The town centre of Abingdon has been renovated in 2012 as part of the council's redevelopment plan, with the 1970s shopping precinct converted to look more modern. The roads around the area have been changed: notably the one-way system around the centre has been partially changed to two-way. While this has slightly reduced traffic within the historic town centre, congestion has greatly increased elsewhere. Local businesses have also complained that the increased traffic has driven shoppers away. Redevelopment of the Old Gaol site, most recently a leisure centre, began in 2010. The first stage was demolishing the 1970s additions and swimming pool extension. The Gaol has been converted into luxury flats, shops and restaurants, with access to the riverside. Radiohead formed in Abingdon in 1985. The band grew to become highly successful, selling more than 30 million albums worldwide. In 2011, Radiohead were ranked the third best British artists of all time by Paste, below only the Beatles and the Rolling Stones. In 2005, Radiohead were ranked number 73 in Rolling Stone's list of "The Greatest Artists of All Time". Abingdon has two non-League football teams: Abingdon United F.C., who play at The Armadillo Energy Stadium, and Abingdon Town F.C., who play at Culham Road. Abingdon RUFC was formed at the Queens Hotel on 27 February 1931. During the 1930s the club was based at the Queens Hotel and games were played on the Council owned recreation ground at Caldecott Road. Immediately after the Second World War the club moved to outside the RAF camp (now Dalton Barracks) which offered on-site changing facilities and later a pitch inside the camp. At the start of the Suez Crisis in 1956 play temporarily returned to the Caldecott Road site because of security risks. This period saw the formation of the ill-fated Abingdon Sports Club; an amalgamation of the town's rugby, cricket and hockey clubs and the bid to establish a sporting centre at Hales Meadow. In a short time the ground was developed and a pavilion erected but the organisation was plagued with financial difficulties and very soon dissolved with hockey disbanding and Abingdon Rugby remaining at the site as tenants to the cricket club. In the mid 1980s a determined effort was made to acquire grounds and a clubhouse dedicated to rugby. The current base at the town's Southern Sports Park was opened by former Abingdon MP John Pattern MP in 1989. Abingdon has had members representing the county, progressing to first-class level and on to international status in the Five Nations Tournament. The Abingdon Sevens traditionally opens the Home Counties' playing season and has attracted sides from throughout the country and beyond. Initiated in 1956 as a one-off tournament to celebrate the town's 400th anniversary of receiving a Royal Charter, it proved so successful that the competition has been held on an annual basis ever since. Several years ago it was decided to introduce the youngsters of Abingdon to Club Rugby. The Youth Section has 200 playing members from the ages of 6 to 18. In 2013–14 Abingdon RFC's President, Paul Murphy MBE, was also the President of the RFU. Since 2016, Oxford Rugby League have played in Abingdon at Abingdon School's Tilsley Park. The Oxford Saints American Football Club play their games in Abingdon at Tilsley Park and are one of the longest running American Football clubs in the UK, founded in 1983. Abingdon is home to Abingdon Rowing Club, with members from 13 to 80 years old. It has had many successes at local and national races, and also holds its own head race in April, one of the main events in the Abingdon Calendar. Its boathouse is on the Wiltsham road. Abingdon Athletics Club takes part in county cross-country leagues. It changed its name from Abingdon Amblers to Abingdon Athletics Club. They train at Abingdon School's Tilsley Park. Industrially, Abingdon was best known for the MG car factory, which opened in 1929. 1,155,032 cars were made at the plant over the next 51 years until British Leyland closed it on 24 October 1980. The Pavlova and Gloria leather works were major employers but both are now closed. Alfred Booth and Company of Liverpool traded with the Pavlova Leather Syndicate from 1860, bought a share in it in 1917–18 and took it over in 1921. In May 1947 at the annual British Industries Fair in Birmingham, Pavlova advertised doe skins, chamois, lambskins and goatskins, much of it as suede, for uses including shoes, gloves and belts. In 1958 Pavlova's site covered 35 acres (14 ha), employed neary 200 people and included a staff sports field. At that time its factory still processed imported skins of sheep, lamb and goat, mainly to make suede. Garner group took over the Booth group in 1979 and became Garner Booth. Pittards plc took over Garner Booth in 1987 and became Pittard Garner. It closed the Pavlova works in 1993. Abingdon was originally home to the Morland Brewery, whose most famous ale was Old Speckled Hen, named after an early MG car. Greene King Brewery bought Morland for £182 million in 1999, closed the brewery and moved production to Bury St Edmunds in Suffolk. The site of the brewery has been redeveloped into housing. The Maltings was demolished and is now a mixed residential area and council offices. In 2010, a craft brewery, Loose Cannon, reinstated brewing in the town at the Drayton Road Industrial Estate and sells its beers locally, including on draught at some local pubs. Abingdon is near several major scientific employers: the UKAEA at Culham (including the Joint European Torus (JET) fusion research project), Harwell Laboratory, the STFC Rutherford Appleton Laboratory and the new Diamond Light Source synchrotron, which is the largest UK-funded scientific facility to be built for over 40 years. Many inhabitants work in Oxford or commute by rail to London, from nearby Didcot. The Army now occupies Dalton Barracks, which, prior to 1993, was the Royal Air Force station RAF Abingdon. Abingdon has a business park which has offices for several local, national and international companies including, until recently, Vodafone (acquired as part of its takeover of Mannesmann in 2000) and Northern Rock bank. The Science Park includes the global headquarters of Sophos, an anti-virus company. RM, an educational computing supplier, commonly refer to themselves as being Abingdon-based, which is technically true—even though their HQ is actually in nearby Milton Park, Milton, they have an Abingdon post code (as does the rest of Milton Park). Penlon Ltd, a medical equipment company, have their premises on the outskirts of Abingdon (their previous site, near the former railway station, has been redeveloped as residential housing). Another major employer is the British head office of the German appliance company Miele. In 1924, car-maker MG was founded and moved its business alongside the Pavlova Leather Factory in 1929. By the outbreak of the Second World War, MG was established as one of the most popular brands of sports car in Britain. After the war, the MG factory continued to churn out increasing volumes of popular sports car which were available at competitive prices. But the factory closed in October 1980 on the demise of the ageing but still popular MG MGB range, and was demolished within months. The headquarters of the MG Car Club, founded in 1930, is at 11 & 12 Cemetery Road, next to the old factory offices. A police station was built in its place, which was later extended with the addition of more cells, as Oxford's police station could not be extended further. Abingdon Bridge spans the River Thames. It was built in 1416 and much altered in the 18th, 19th and 20th centuries. The incumbent Member of Parliament for Oxford West and Abingdon is Layla Moran (Liberal Democrat). The town is also represented on Oxfordshire County Council. Of the Benedictine Abingdon Abbey there remains a beautiful Perpendicular gateway (common local knowledge, however, is that it was actually rebuilt out of the rubble of the original, and a little cursory examination of the patternation of the stonework will apparently divulge this) and ruins of buildings such as the mainly Early English prior's house, the guest house and other fragments. Other remains from the former abbey include the Unicorn Theatre and Long Gallery, which are still used for plays and functions including an annual craft fair. Abbey Gateway between the Abingdon County Hall Museum and the Guildhall remains a point of local importance. Although it is unclear how far back this tradition dates, some people from families that have lived in the town for generations follow the superstition that in walking under the gateway one should hold one's breath to stop the gargoyles that decorate the gateway from stealing it. St. Helen's Church dates from around 1100 and is the second-widest church in England, having five aisles and being 10 feet (3 m) wider than it is long. The tower of St Helen's Church has a modern ring of ten bells, cast by the Whitechapel Bell Foundry in 2005 and hung in a new frame with new fittings by White's of Appleton in 2006. St. Nicolas' Church, parts of which were built in 1180, is near the museum. Abingdon Bridge over the Thames, near St Helen's Church, was built in 1416 and widened or altered in 1790, 1828, 1927 and 1929. Abingdon's county hall by the main market square, built in 1677–1680 reputedly by Christopher Kempster, stands on columns, leaving the ground floor open for a market and other functions. It was once hailed as the "grandest town hall in Britain". It now houses the Abingdon County Hall Museum and is run by Historic England. A gaol, built by prisoners of the Napoleonic Wars in 1811, is on the south edge of town next to the Thames. In the 1970s the gaol was converted into a leisure centre. In 2011 the site was developed into residential and commercial premises. According to local legend, prior to its conversion in the 1970s, the gaol was haunted by the ghost of an eight-year-old boy who, after being convicted for arson in the mid-19th century, became the youngest person in the UK to be executed by hanging. The Roysse Room was the site of Abingdon School (then 'Roysse's School') from 1563 until it moved to its current site after an indenture by John Roysse, who had been born and educated in Abingdon before he moved to London. The room is now part of the civic offices. Abingdon has the remains of a motte-and-bailey castle, which can be found to the north of the town centre surrounded by trees within a housing estate. Originally built of wood or stone, it was a fortification on a raised earthwork called a motte surrounded by a protective ditch. There is a Second World War FW3/28A pillbox by the River Ock near Marcham Road. Bun Throwing is an Abingdon Tradition that began with the 1761 Coronation of King George III. This long-standing tradition of the town has local dignitaries throwing buns (5,000 buns in 2018) from the roof of the Abingdon County Hall Museum into crowds assembled in the market square below on specific days of celebration (such as royal marriages, coronations and jubilees). The museum has a collection of the buns, dried and varnished, dating back to bun throwings of the 19th century. To date there have been 35 bun throwing events. Since 2000, there have been bun-throwing ceremonies to commemorate the Millennium, the Golden Jubilee of Queen Elizabeth II in 2002, the 450th anniversary of the town's being granted a royal charter in 2006, the Royal Wedding of Prince William and Catherine Middleton in 2011, and the Diamond Jubilee of Elizabeth II in 2012, and to celebrate the centenary of the end of the World War I in November 2018. The centre of town and the whole of Ock Street (half a mile) are closed every October for two days for the Ock Street Michaelmas Fair, once a hiring fair but now maybe Britain's longest and narrowest funfair. The much smaller Runaway Fair, the following Monday, was traditionally for workers who had found their new employers too much to take within the first week. Abingdon has a very old and still active Morris dancing tradition, passed on since before the folk dance and song revivals in the 19th century. Every year a Mayor of Ock Street is elected by the inhabitants of Ock Street; he then parades through the town preceded by the famous Horns of Ock Street, a symbol of Abingdon's Morris Dance troupe. The Friends of Abingdon's Unicorn Theatre, housed in the old Abbey buildings, is the site of first productions of many stage adaptations of Terry Pratchett's Discworld novels, by Stephen Briggs. Old Speckled Hen ale was originally brewed by Morland's of Abingdon to commemorate the MG factory in the town. It continues to be brewed by Greene King along with several complementary beers. See also Abbot of Abingdon, Abingdon School and List of Old Abingdonians. Michelle Goodman DFC, RAF Pilot and First Female Pilot to receive the DFC (b. 1976), lives in Abingdon. Dorothy Richardson, novelist, born in Abingdon. She was the first writer to publish an English-language novel using what was to become known as the stream-of-consciousness technique. Abingdon and Witney College: provides further education. Abingdon School: private, boys, 11–18. Depending upon which of two dates is correct for the school's founding, it is either the thirteenth-oldest or the sixth-oldest school in the country. Our Lady's Abingdon: private, mixed, 3–18. School of St Helen and St Katharine: private, girls, 9–18. ^ "Abingdon on Thames". Mapit. Retrieved 17 January 2018. ^ "Area: Abingdon (Parish): Key Figures for 2011 Census: Key Statistics". Neighbourhood Statistics. Office for National Statistics. Retrieved 25 March 2015. ^ "Area selected: Vale of White Horse (Non-Metropolitan District)". Neighbourhood Statistics: Full Dataset View. Office for National Statistics. Archived from the original on 22 June 2011. Retrieved 3 April 2010. ^ "Getting to Abingdon-on-Thames by train". Abingdon-on-Thames. Retrieved 27 September 2016. ^ Harden 1940, p. 165. ^ Zeuner 1952, p. 240. ^ a b c d Hoiberg 2010, p. 33. ^ Gelling 1957, pp. 54–62. ^ Jacobson, Curtis (September 2007). "Abingdon For MG Enthusiasts". Longmont, CO: British V8. Retrieved 31 December 2009. ^ "Introducing Abingdon". localauthoritypublishing.co.uk. Archived from the original on 20 February 2009. ^ Abingdon County Hall: Information for Teachers (PDF). Colchester: Palladian Press for English Heritage. 2004. ^ "Berkshire Quarter Sessions". Jackson's Oxford Journal. 4 July 1868. Summer assizes were moved from Abingdon in 1867, effectively making Reading the county town. However, the Home Office informed the county's court of quarter sessions that in moving the court they had acted ultra vires, and that they were required to petition the Privy Council to make the change. The petition was duly submitted and the change was officially approved with effect from the summer of 1869. ^ Williams, Amanda (25 November 2011). "Public to have say on renaming town". Oxford Mail. Newsquest. ^ Wilkinson, Ben (24 February 2012). "It's all change at Abingdon-on-Thames". Oxford Mail. Newsquest. Retrieved 24 February 2012. ^ Meyrick 2007, pp. 29–35. ^ Meyrick 2007, p. 34. ^ Gordon Rogers (7 December 2006). "Traders fear bigger Tesco". Oxford Mail. Newsquest. ^ "Traders claim revamp 'hit business'". 15 April 2013. Retrieved 25 February 2019. ^ "Abingdon Integrated Transport Strategy (ABITS)". ^ "Construction starts on Abingdon Gaol development". BBC News. 25 August 2010. ^ Stiernberg, Bonnie (29 April 2011). "The 50 Best British Artists of All Time". Paste. ^ a b "History". Booth and Co. 2014. Retrieved 25 March 2015. ^ John 1959, p. 116. ^ John 1959, p. 130. ^ "Pavlova Leather Co". Grace's Guide: The Best of British Engineering 1750–1960s. 1 November 2008. Retrieved 25 March 2015. ^ John 1959, p. 186. ^ "Your town councillors". abingdon.gov.uk. ^ "St. Helen, Abingdon, Oxon". Oxford Diocesan Guild of Church Bell Ringers. 2009. ^ a b Jervoise 1930, p. 7. ^ Jervoise 1930, p. 6. ^ Leeming & Salter 1937, pp. 134–140. ^ "Pillbox FW3/28A Abingdon". tracesofwar.com. Retrieved 18 June 2013. ^ "World of Bun Throwing". worldofbunthrowing.blogspot.com. Retrieved 14 November 2018. ^ "Abingdon Traditional Morris Dancers". ^ "Mr Hemmings' Traditional Abingdon Morris Dancers". ^ a b c d "Abingdon-on-Thames Twin Towns". Ditchfield, P.H. ; Page, W.H., eds. (1907). "The abbey of Abingdon". A History of the County of Berkshire. Victoria County History. 2. London: Archibald Constable & Co. pp. 51–62. Ditchfield, P.H. ; Page, W.H., eds. (1907). "Hospitals – Abingdon". A History of the County of Berkshire. Victoria County History. 2. London: Archibald Constable & Co. pp. 92–93. Gelling, M (1957). "The Hill of Abingdon" (PDF). Oxoniensia. Oxford Architectural and Historical Society. XXII: 54–62. ISSN 0308-5562. Harden, D.B. (1940). "The Geological Origin of Four Stone Axes Found in the Oxford District" (PDF). Oxoniensia. Oxford Architectural and Historical Society. V: 165. ISSN 0308-5562. Hoiberg, Dale H., ed. (2010). "Abingdon". Encyclopædia Britannica. I: A-ak Bayes (15th ed.). Chicago, Illinois: Encyclopædia Britannica Inc. p. 33. ISBN 978-1-59339-837-8. Jervoise, Edwyn (1930). The Ancient Bridges of the South of England. I. Westminster: The Architectural Press for the SPAB. pp. 6, 7. John, A.H. (1959). A Liverpool Merchant House: Being the History of Alfred Booth and Company 1863–1958. London: George Allen & Unwin. ISBN 0415381592. Leeming, J.J.; Salter, H.E. (1937). "Burford Bridge, Abingdon" (PDF). Oxoniensia. Oxford Architectural and Historical Society. II: 134–140. ISSN 0308-5562. Retrieved 27 October 2013. Meyrick, Ian (2007). Oxfordshire Cinemas. Images of England. Brimscombe Port: Tempus Publishing. pp. 29–35. ISBN 978-0-7524-4333-1. Mills, A.D.; Room, A. (2003). A Dictionary of British Place-Names. Oxford: Oxford University Press. ISBN 0-19-852758-6. Page, W.H. ; Ditchfield, P.H., eds. (1927). "The borough of Abingdon". A History of the County of Berkshire. Victoria County History. 4. London: The St Katherine Press. pp. 430–451. Pevsner, Nikolaus (1966). Berkshire. The Buildings of England. Harmondsworth: Penguin Books. pp. 51–60. Sullivan, Paul (2012). "Legends, Superstition and the Supernatural – Grave News". The Little Book of Oxfordshire. Stroud: The History Press. ISBN 978-0752477381. Zeuner, F.E. (1952). "A group VI neolithic axe from Minster Lovell, Oxfordshire". Proceedings of the Prehistoric Society. Cambridge University Press for The Prehistoric Society. XVIII (2): 240–241. ISSN 0958-8418. Wikisource has the text of the 1911 Encyclopædia Britannica article Abingdon. 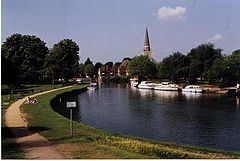 Wikimedia Commons has media related to Abingdon-on-Thames. 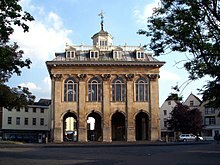 Wikivoyage has a travel guide for Abingdon. This page was last edited on 18 April 2019, at 22:40 (UTC).